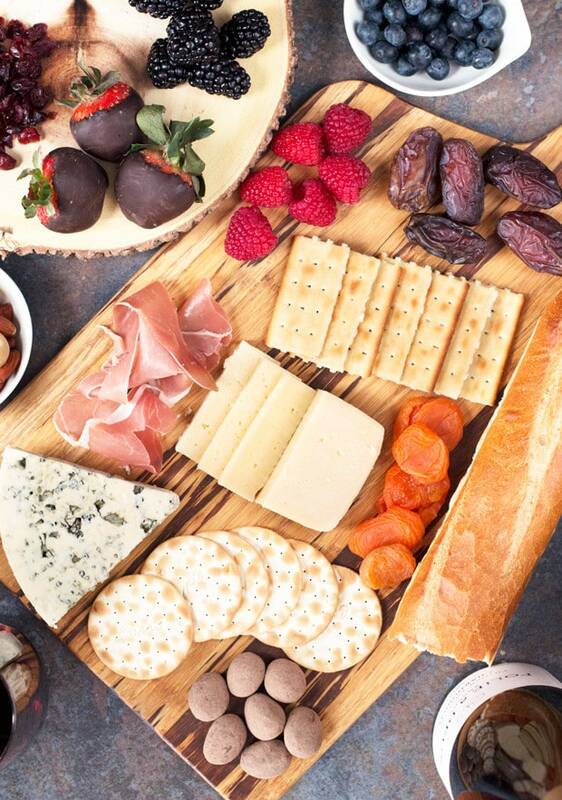 The Ultimate Valentine’s Day Cheese Board is the way to your boo’s heart (or the perfect way to celebrate your true friend love with your BFFs) this Valentine’s Day. 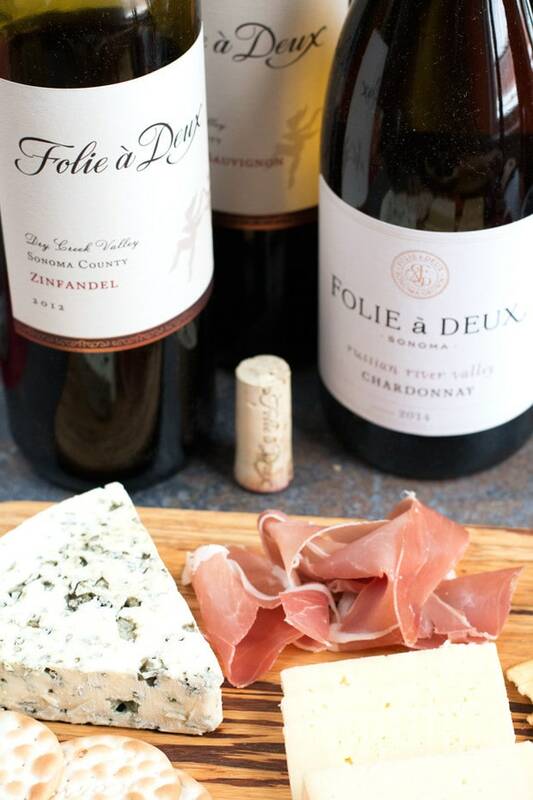 A little sweet, a little savory, and full of variety, you can spend a romantic evening cuddled up with plenty of wine. 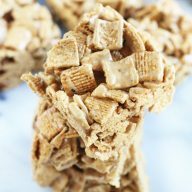 With Valentine’s Day just around the corner, I’ve been racking my brain for a recipe to celebrate. Originally I was going to share some cinnamon rolls with you, but they turned out to be an epic fail (first one of many this year, I’m sure). So instead of spending all your time on a complicated recipe this year, why not dive into a romantic cheese board? Just picture this – a couple bottles of wine, a gourmet spread of cheese, crackers, and other goodies, snuggling up with your boo under a blanket surrounded by candles. Pretty damn romantic, am I right? OR picture several bottles of wine, the gourmet spread, chick flicks and your besties giggling like children during an epic sleepover, 1990s style. Except with fine wine and cheese. Because we’re adults now and we’re classy. 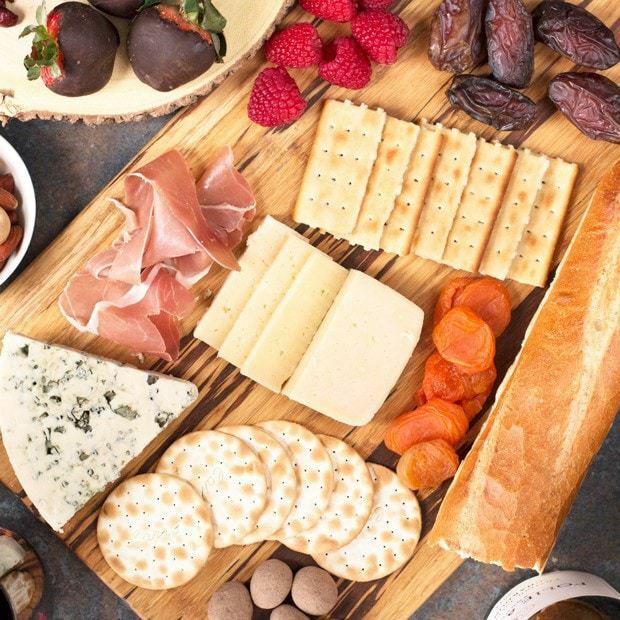 Regardless of how you plan to spend your Valentine’s Day, this cheese board is a must. 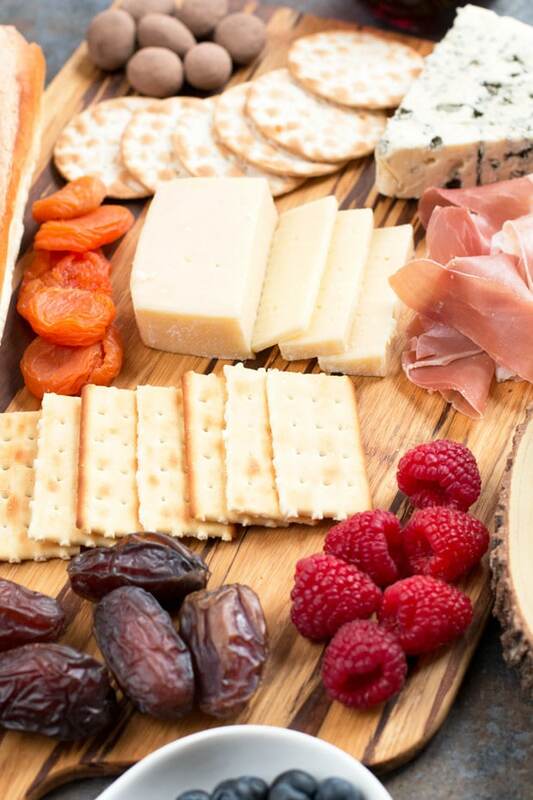 Building the ultimate Valentine’s Day cheese board is easy, as long as you are sticking with the good stuff, like Castello cheeses. Castello really pulls out all the stops with their variety of cheeses, from soft to hard, aged to double creme, making them a great addition to any cheese board. It was SO hard to narrow it down to just two (the ideal number for a cheese board meant for two, but if you have more people to serve go ahead and throw more on there). When I finally made my decision, I went with the Aged Havarti and Extra Creamy Danish Blue – one that’s a little more mild and one that’s a little more bold (love me some stinky cheese!) to really have some contrast on the board. After you get the cheese, it’s all about adding the extra goodies to go along with the cheese. Just remember, the key to an amazing cheese board is VARIETY. 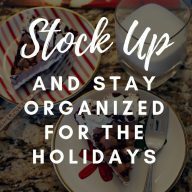 I love to pick and choose different goodies, experiment with flavors and indulge in items I only get a couple times a year (ahem, chocolate-covered strawberries anyone?). For my Valentine’s Day board, I wanted to nail the balance of salty and sweet. For the sweet, I loaded the board up with chocolate-covered strawberries, blueberries, blackberries, raspberries, dried fruit and some chocolate-covered almonds (so addictive and at Whole Foods. 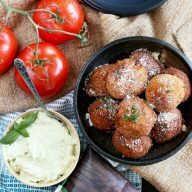 I dare you not to eat them all before they make it on the board). 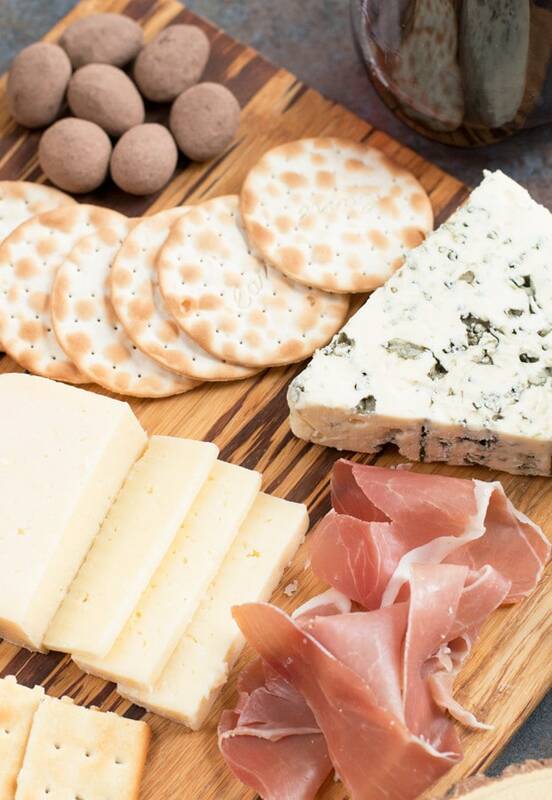 For the salty, you have the cheeses (DUH), a variety of nuts, prosciutto, crackers and a French baguette (because carbs don’t count on holidays). Oh and don’t forget to enter the Castello sweepstakes they have going on right now! Trust me, you want in on this one. Assemble a balanced sweet and salty cheese board for a romantic night in. 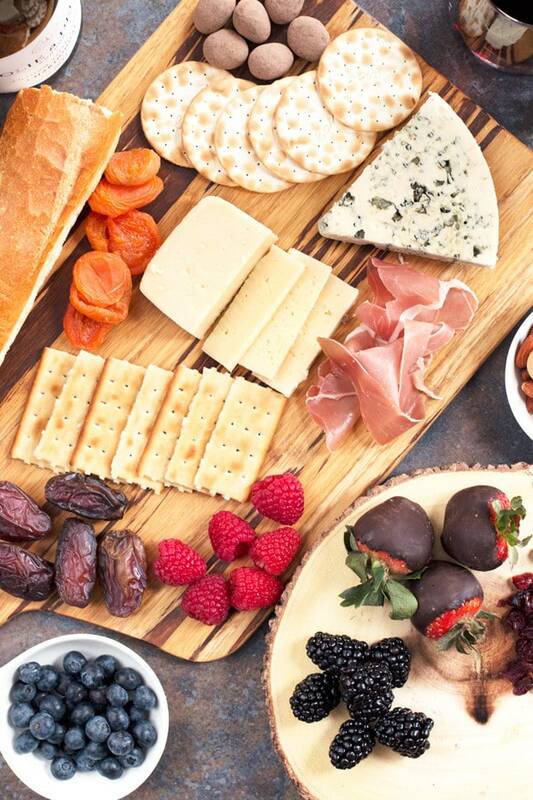 Arrange the cheeses and other ingredients on a large marble slab board or large wood serving tray. Make sure to include small cheese knives to serve the cheese. Make the awesome chutney featured in the video below. Add it to your gourmet spread. Have fun trying new combinations! Pin The Ultimate Valentine’s Day Cheese Board recipe for later! Disclosure: I received free product from Castello and Folie à Deux as part of this sponsored post. As always, all opinions are my own. Thanks for supporting the brands that support Cake ‘n Knife! Castello danish blue cheese is actually a favourite in our household because it always seems to be the best deal at the store, and we love it! This is a beautiful cheeseboard and since we’re already planning on staying in with a bottle or two of wine, this might be exactly what I serve up for our VDay this year. Those chocolate covered almonds look especially good. This is fantastic! I’m always super jealous of people who have the capability to build a great cheese board, but it seems like it wouldn’t be TOO hard to do. Thanks!